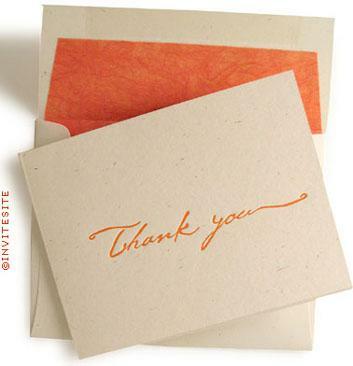 Letterpress printed cursive thankyou note in orange ink, with lined envelope. 100% postconsumer recycled stock and printed with vegetable ink. Envelope liner is treefree, sugarcane and mulberry. Fold at side -- landscape design. Opens flat to 11x4.25 inches. Milkweed recycled cardstock with matte finish. Matching envelope. Mulberry orange envelope liner. (assembly required - gluesticks included). Cardstock is 110 pound, 100% postconsumer recycled paper, and made in USA. Sidefold thankyou note measures 11x4.25 open. Handsome matching milkweed 100% postconsumer recycled paper envelope, 70 pound paper.